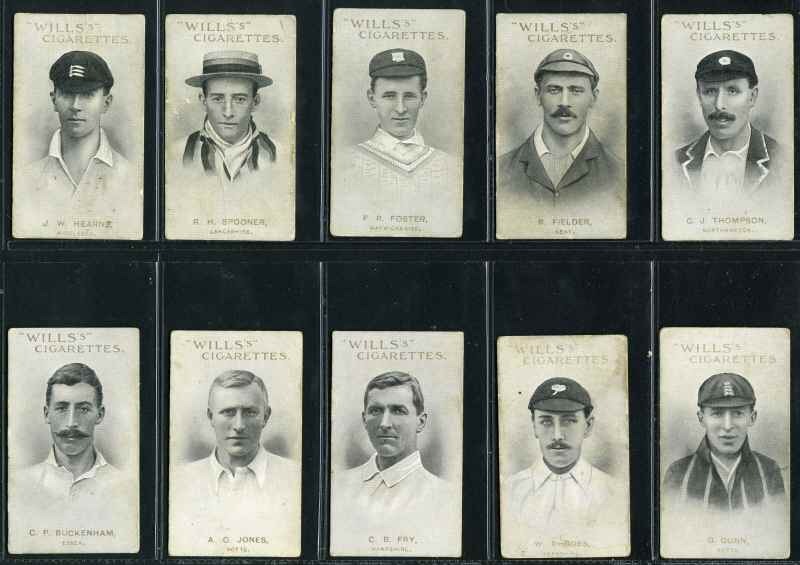 Collection of 640 different Wills cigarette cards including 1902 Soldiers of the World (32), 1906 Horses of Today (17), 1908 Flag Girls of all Nations (39), 1908 Girls of all Nations (43), 1910 Aviation Series of 75 (51) and Series of 85 (46), 1910 Types of the Commonwealth Forces (32), 1910 Arms and Armour (41), 1913 Best Dogs and Their Breed (26), 1913 Historic Events (36), 1915 Britains Defenders (32), 1915 Victoria Cross Heroes (8, inc 3 Havelock backs) and 1917 Sports of the World (34). Mainly G/VG condition. Catalogue Value £1,656.00. 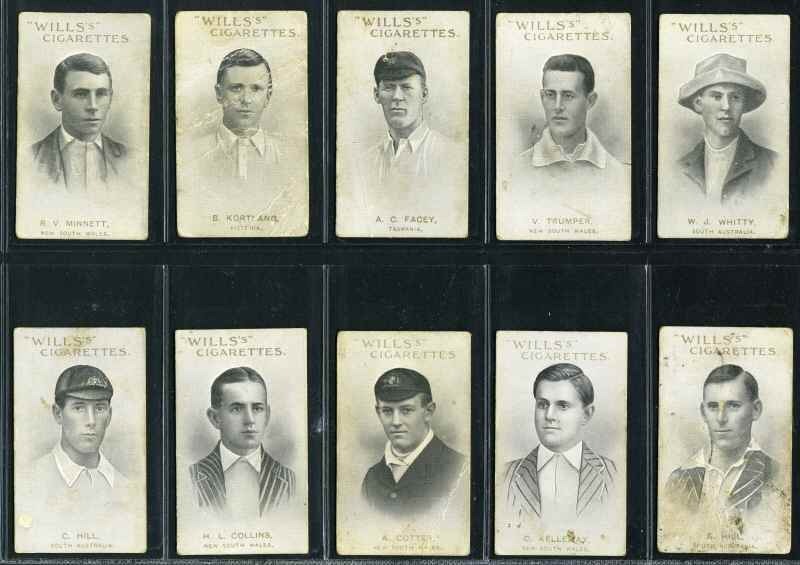 Selection of 280 Wills cigarette cards including 1902 Soldiers of the World (9), 1908 Flag Girls of all Nations (30), 1908 Girls of all Nations (47), 1910 Aviation (12), 1910 Kings and Queens of England silk (6), 1910 Types of the Commonwealth Forces (27), 1915 Britains Defenders (11) and 1917 Sports of the World (16). Some faults, but mainly VG condition with light duplication. Catalogue Value £674.00. 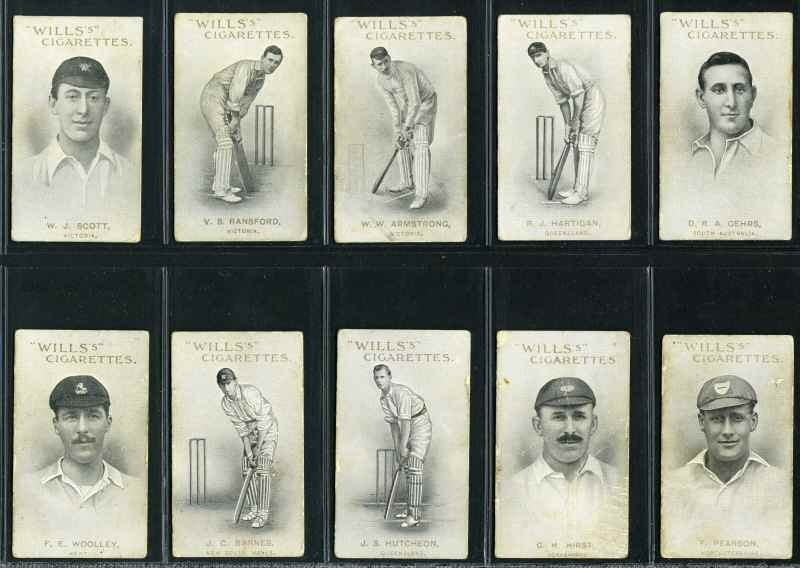 Wills selection of 208 mainly different cigarette cards including 1906 Horses of Today (17), 1906 Melbourne Cup Winners (8), 1907 Australian and English Cricketers (16), 1908 Time and Money in Different Countries set of 50, 1909 Australian and English Cricketers Red Border (8), 1910 Australian and South African Cricketers Red Border (5), plus 39 Trade cards including Nabisco Foods 1948 Leading Cricketers (23). 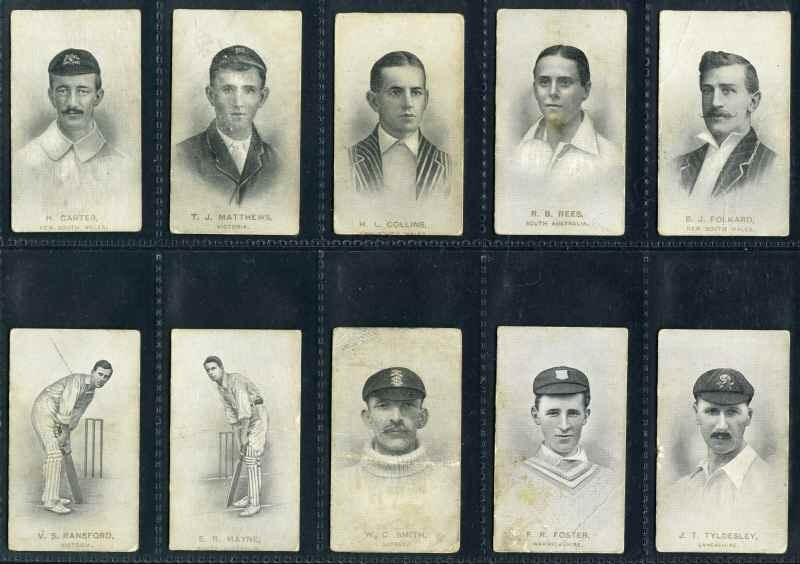 Cricket and Horse cigarette cards in poor condition, otherwise G/VG. Murray's catalogue value £890.00. 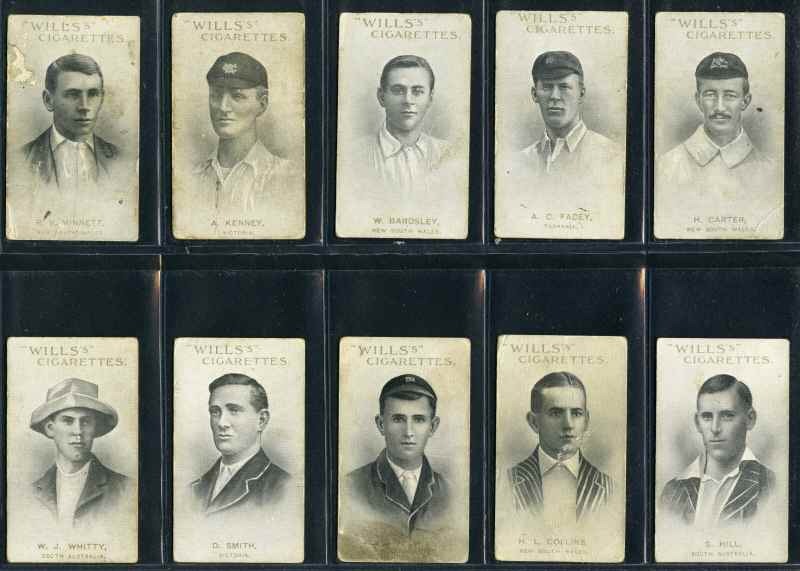 Selection of 136 Wills silk cigarette cards including 1910 Kings and Queens of England (13), 1913 Australian Wildflowers (7), 1913 Popular Flowers (13) and 1916 War Medals (44). Mainly VG condition. Catalogue Value £510.00. 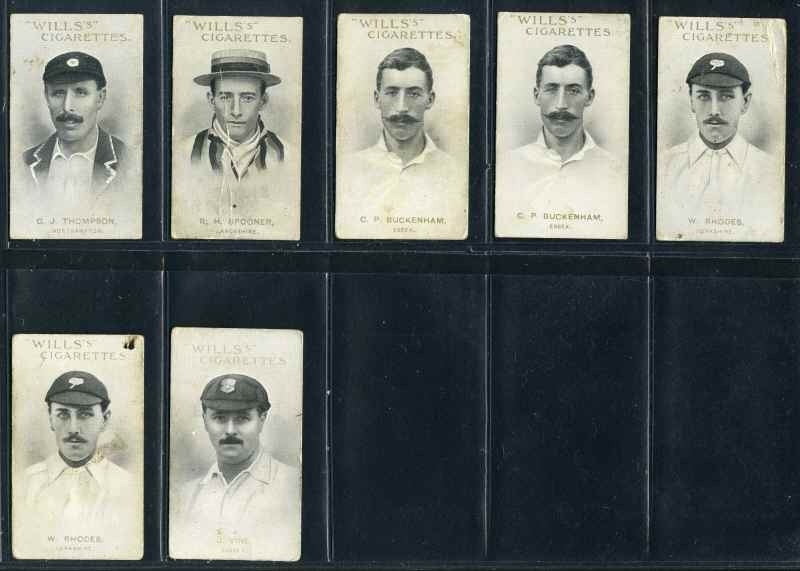 Wills collection of 1,182 cigarette cards including 1908 Flag Girls of all Nations (15), 1909 Australian and English Cricketers Red or Blue Border (5), 1910 Australian and South African Cricketers Blue Border (4) and Red Border (9), 1910 Arms & Armour (67), 1910 Arms of the British Empire (60), 1910 Aviation (114), 1910 The World's Dreadnoughts (27), 1910 Types of the Commonwealth Forces (68), 1912 Birds of Australasia (106), 1912 British Empire Series (206), 1912 Fish of Australasia (115), 1912 Signalling Series (143), 1912 Types of the British Army (13), 1913 Historical Events (62), 1913 Royal Mail (57), 1915 Victoria Cross Heroes (19), 1915 War Incidents A Series (17) and more, mixed Capstan and Vice Regal backs, with some Havelock backs. Also 84 mainly Sniders and Abrahams cigarette cards including 1912 Animals and Birds (45), plus 49 Trade cards. Some duplication and faults, but many in VG condition. Murray's catalogue value £2,392.00+. 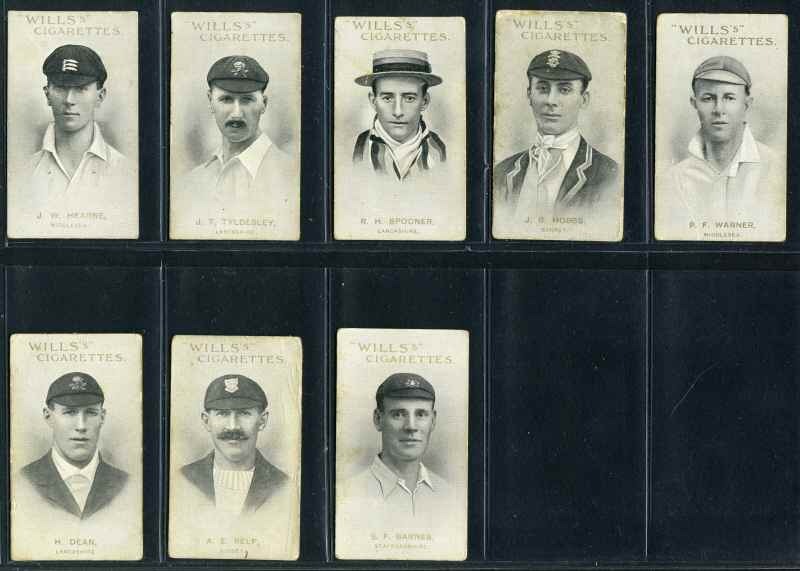 Wills 1911 Australian and English Cricketers, Capstan backs (35/59, plus 17 spares), Vice Regal backs (28/59, plus 6 spares) and No Brand backs (15/59) cigarette cards. Some in poor condition, otherwise G/VG. Churchman 1931 Landmarks in Railway Progress (48/50), C.W.S. Ltd 1934 Musical Instruments (28/48), Gallaher 1925 Famous Footballers Green backs (86/100), Godfrey Phillips 1925 Kings and Queens of England (33/37), Richard Lloyd & Sons 1935 Cinema Stars 2nd Series (23/27), Ogdens 1934 Trick Billiards (49/50), Players 1904 British Empire Series (48/50), 1923 Bonzo Dogs by Studdy (6/25), 1930 Cricketers 1930 (46/50, includes Don Bradman) and Wills 1902 Kings & Queens long "Wills" at base (11/51) cigarette cards. Mainly VG/Excellent condition. Catalogue value £860.00. 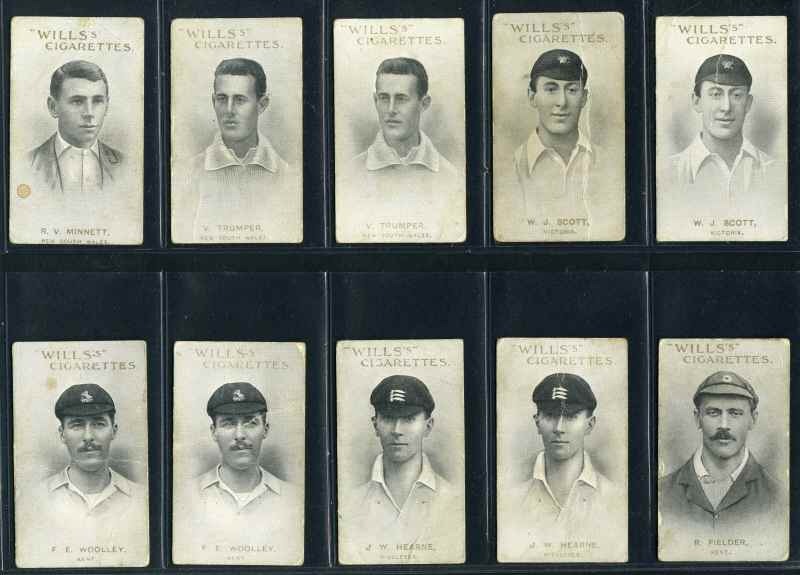 Selection of 243 cigarette cards including Cohen Weenen Co Ltd 1916 War Series (24/50), Carreras Ltd 1934 Cricketers (16/20), R & J Hill 1923 Famous Cricketers (20/40), Lambert & Butler 1922 Motor Cars (24/25), Richard Lloyd & Sons 1935 Cinema Stars (7/27), 1936 Atlantic Records (17/25), Millhoff 1932 Real Photographs 4th Series set of 27 and Ogdens 1901 Leading Generals at the War (11/25), 1906 Owners, Racing Colours & Jockeys (39/50). Mainly VG condition. Catalogue Value £725.00. Gallahers 1938 Racing Scenes, R & J Hill 1930 Music Hall Celebrities Past & Present, Lambert & Butler 1928 Homeland Events, 1932 A History of Aviation, 1934 London Characters, Millhoff 1932-33 Real Photographs 3rd, 4th, 5th and 6th Series, Players 1930 Ships Flags & Cap Badges, 1933 Derby and Grand National Winners and Teofani & Co 1938 Past & Present Series "B" Weapons of War complete cigarette card sets. VG/Excellent condition. Catalogue value £610.00. 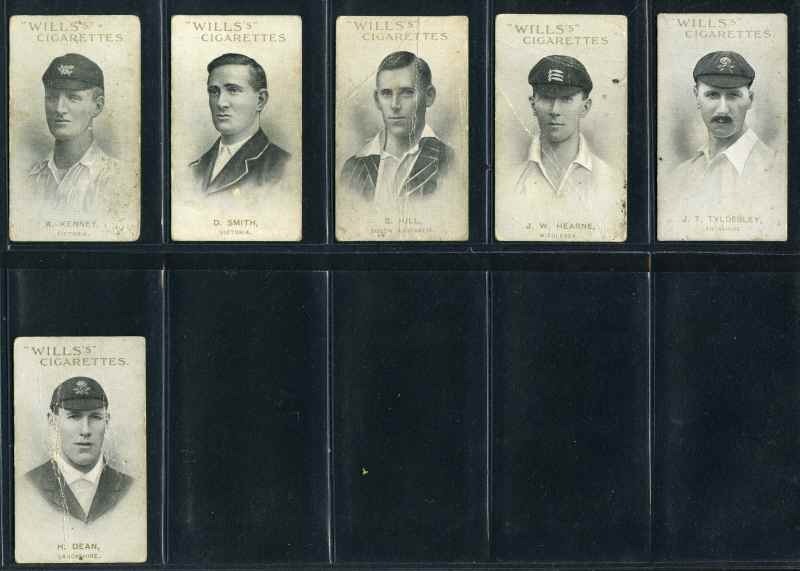 Godfrey Phillips 1934 Stars of the Screen, 1937 Sportsmen - Spot the Winner, Hignett Bros 1927 Beauties and R.J. Lea 1925 Ships of the World complete cigarette card sets. VG/Excellent condition. Catalogue value £300.00. Ogdens 1925 Modern British Pottery, 1928 Applied Electricity, 1932 By The Roadside, 1932 Colour in Nature, 1936 Cathedrals & Abbeys, 1936 Picturesque Villages, 1939 Sea Adventures, Richard Lloyd & Sons 1924 Old Inns, Rothmans Ltd 1925 Cinema Stars and Westminster Tobacco Co Ltd 1929 New Zealand 2nd Series complete cigarette card sets. VG/Excellent condition. Catalogue value £440.00. 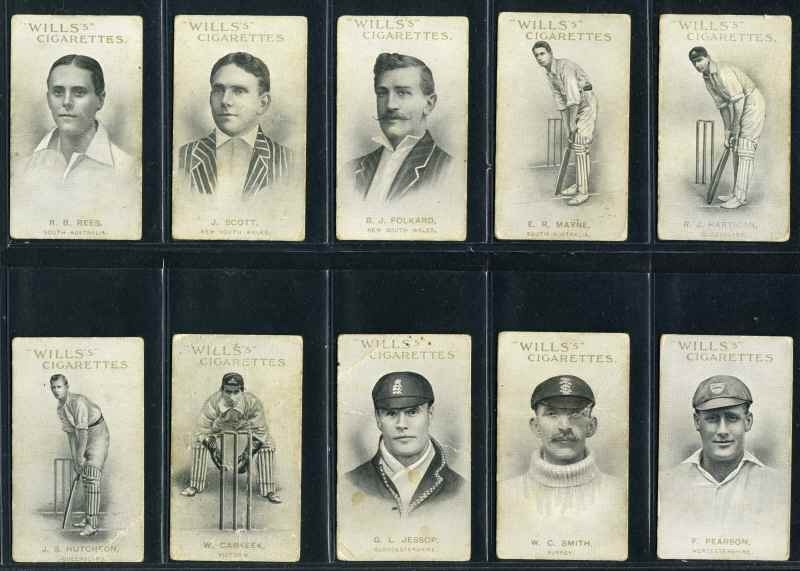 Selection of 57 cigarette cards including Taddy & Co 1899 Actress with Flowers (1), 1901 Boer Leaders (3), Gallaher 1899 Regimental Colours and Standards (18), Ogdens 1901 Victoria Cross Heroes (5), Wills 1898 Kings and Queens (12) and 1902 Coronation Series (12). Some faults, but many in G/VG condition. Catalogue Value £429.00. 5 Cigarette Card Binders with cardboard slipcase in new condition. 17cm x 33cm with "Cigarette Card Album" gold lettering on front. 288 Secondhand plastic Cigarette card pages in VG condition. Mainly size 4, 6 and 10.